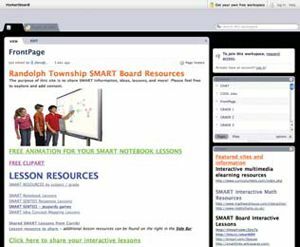 In summer 2007, Randolph (NJ) Township Schools created a wiki on which administrators and supervisors could discuss Grant Wiggins’s Understanding by Design. “At first people rolled their eyes, but once they saw that it was a Web page to interact with, they liked it,” says Jennifer Fano, an administrator. Fano began doing teacher workshops that led to the creation of more wikis. Students saw them and started their own wikis to use as study guides, posting questions about what they wanted to learn. Debbie Iosso, principal of Randolph High School, uses a wiki to communicate with her 75-person staff. “It’s nice to have a collaborative environment where we can share information and everyone can see each other’s comments,” she says. Her wiki has staff agendas and resources, including links to articles on differentiated instruction, which has been a district-wide focus. When Iosso invited an expert on differentiated instruction to look at the wiki, the expert added her own comments. Across the district, wikis have sprouted up everywhere. Middle and high school teachers use them for group projects. A math teacher who solves problems with the screencapturing tool Jing (jingproject.com) embeds his work into his wiki for continuous review. Third-, fourth-, and fifth-grade teachers use wikis to create centers that include directions for assignments and student work. Whenever there’s a committee meeting or a professionaldevelopment workshop, an accompanying wiki has related lessons or other relevant pieces. The district has even started a wiki for parents. “Often parents leave a meeting and feel like they have nothing to go home with,” says Iosso. Now they can log on to a wiki that contains resources such as helpful articles.